Hire a car in Krakow Airport, John Paul II, at a lower cost | Compare SUV, MPV, estate & minivan hiring costs for Warsaw, Krakow. Compare and book cheap car hire in Krakow Airport. Also save when book a 7 or 9 seater minivan, or a sporty SUV. When booking your next trip to Krakow and need to hire a vehicle, know that you can rest assured you will get a quality car and at a discounted price. Pre-book your car Polish car rental and save on usual published rates. If you are still at the planning stage, then simply enter your Krakow car hire requirements and receive an online quote. Popular rental Poland locations include Krakow and Warsaw Airports. You can find 7 & 9 seater for your family, or friends, and enjoy comfortable touring holidays. We have small economy cars from the Opel stable, including the Corsa and Astra estate and Vectra. Toyota offer the Yaris, Altis and Camry. Larger MPV and SUV from Nissan and include the Note and Primastar, to cater for larger groups or families. Look for Express and Budget, who offera free additional driver included in their rates. About forty million Poles live here. Cars are driven on the right. Call Poland using +48. The currency is called the Zloty. Became an independent republic in 1989. The Republic of Poland lies in the central part of Europe. The Polish lakes of Pomeranian and Masurian are found in the northern part of the country. 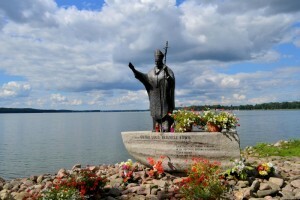 The Masurian land lake is one of the more famous tourist attractions in Poland, especially for those who love to sail. The Baltic Coast lies further north where you can find sandy beaches. The cities of Poland are all tourist attractions in their own right because of the presence of historical monuments. Compare vehicle rental at Poland Airports. Budget SUV hire in Warsaw and Gdansk & more.